"A puzzle video game that has you build large structures using balls of goo." A puzzle game that is completely built around the sole idea that you create large structures using balls of goo - World of Goo was originally developed for both the Nintendo Wii console and Microsoft Windows. Now it is also available for mobile devices so you can play the game on the go. 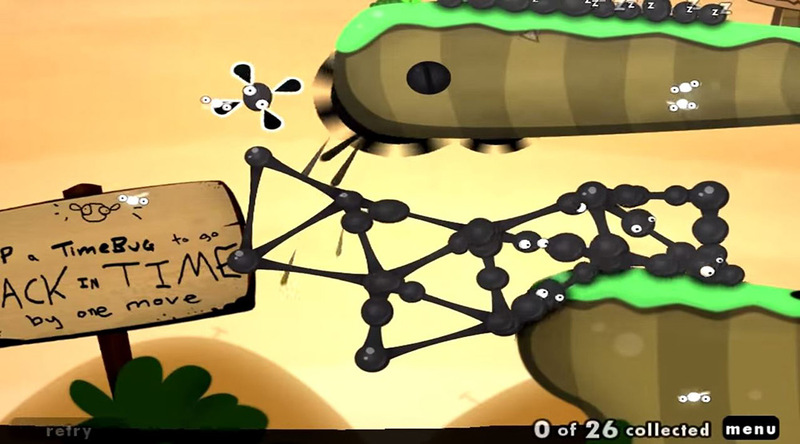 World of Goo has been so successful it has also won several notable awards, making it one of the most recognized indie games of the last decade. Using balls of goo to build large structures, you are to build the structures so you can pass the levels that you are on. This can range from extremely easy to extremely difficult as you proceed through the game. Each of the levels are unique and has their own soundtrack specific to the level. These things give each individual level its own unique atmosphere, therefore making the game a lot more interesting as you continue playing and getting challenged by the difficult of the obstacles you must bypass. The main objective of the game is to get a certain number of goo balls to a pipe that is designed to represent the exit of the level. To do this, the player has to use the goo balls to make bridges, towers, and other structures to bypass gravity and various obstacles in the levels that block your patch to the exit. The obstacles can range from hills, chasms, cliffs, spikes, and more. This will become more and more unique as you continue to play the game and the difficulty of the levels increases. This version of World of Goo is just the free demo of the game, but you can try it out here for free just to see if you like it.